Prep. Time: 10 min. | Cooking Time: 360-480 min. 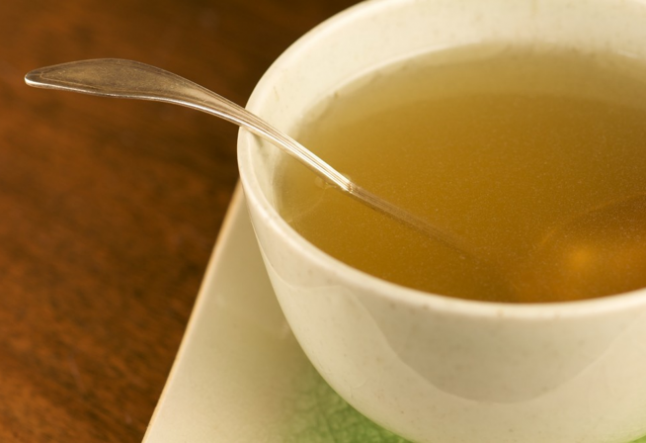 Home made soup broth is a lovely way to add great flavor and nutrition to many meals. Plus, it's like veggie recycling! Gather the ends and peels from your vegetables (you can do this for a week or two prior to making broth and store them in the fridge or freezer). Options include onion ends and skins, potato peels, celery and carrot tops, kale, chard or collard stems. Fill a large pot with the vegetables plus an extra onion, and cover with water. Bring to a boil and then simmer on low for about 6-8 hours. Strain and use right away or transfer to freezer-safe containers like muffin tins and freeze into bouillon cubes. It's the perfect way to make flavorful and healthy broth using food that would normally go in the compost. Allison Rivers Samson is the owner of allisonsgourmet.com, an award-winning artisan bakery and confectionary boutique. Notes & tips: Don't use veggies you wouldn't normally cook, like cucumbers or lettuce. Any good ends such as greens, stems or peels that you don't normally eat from veggies that you do normally cook.